The privatelaunch firm UPAerospace has postponed the planned launch of its second rocket this month asit roots out the source of an in-flight glitch that doomed a September spaceshot. UPAerospace officials initially hoped to launch their second unmanned suborbital SpaceLoftXL rocket - dubbed SL-2 - on Oct. 21, but opted to allow more time to completelyinvestigatethe failure of the booster's flightdebut last month. "Theinvestigation is going very well," UP Aerospace president Jerry Larson told SPACE.com,adding that the precise cause of the crash is close at hand. "We're homing inon what I believe is the cause...we want to make sure that we finish theinvestigation properly and don't leave any stone unturned." Larson saidUP Aerospace is now preparing to launch its next rocket by the end of the year.Like its predecessor, the next SpaceLoft XL rocket will lift off from NewMexico's state-funded Spaceport America,near Upham - about 45 miles (72 kilometers) north of Las Cruces - in a remotearea known for its low population density. "To successfully fly in 2006 is our goal," Larson said. "We're all extremely excitedthat we got the first launch off and it did well, but obviously we would have likedto make space. That was our ultimate goal." UPAerospace's 20-foot (six-meter) SpaceLoft XL rocket debutedon Sept. 25, when the booster shot from its raillaunch pad only to wobble seconds after liftoff and come crashing back toEarth. The rocket -designed to carry 110-pound (50-kilogram) payloads to suborbital altitudes ofup to 140 miles (225 kilometers) - reached a maximum height of about 40,000feet (12,192 meters) before returning to Earth, according to past reports. The Sept.25 launch marked the first-ever flightstaged from Spaceport America. "There wasno structural damage to the vehicle during the flight at all, nothing broke," Larsonsaid, adding that initial concerns that the rocket's fins were damaged inflight proved unfounded once the wreckage was recovered. "The vehicle is strongenough to withstand a Mach 4 corkscrew." 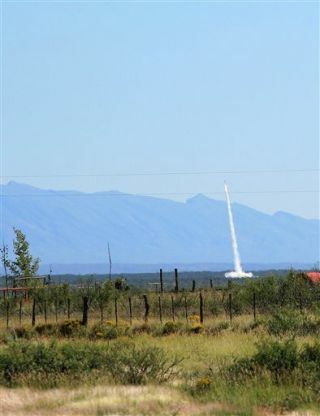 It took UPAerospace officials about one week to retrieve the SpaceLoft XL wreckage withthe help of radar data from monitoring stations at New Mexico's White SandsMissile Range. "If we didnot have that radar data, it would have taken us much longer, if not made italmost impossible," Larson said of the recovery effort and subsequentinvestigation. "They could see the oscillations of the motion and what wasphysically going on with the body during flight." In additionto UP Aerospace's investigation, Spaceport America officials have also formedan Anomaly Investigation Board to review the SpaceLoft XL's crash. "We've gotto get the Spaceport's approval, and White Sands' and the Federal AviationAuthorities," Larson said, stressing that fixing the anomaly safely is vitalfor future SpaceLoft XL flights. "So there are a lot of players." Despite theSept. 25 crash, Larson's said UP Aerospace gained valuable suborbital launchexperience that went far beyond that attained during dress rehearsals. "The launchcrew performed flawlessly," Larson said, adding that half of the flight'sground personnel were Spaceport America officials, with the other half staffedby UP Aerospace. "It gives me hope that we'll be able to launch multiple timesin a day because it was so slick." UPAerospace is not alone in its rocky debut of a new launch vehicle. Earlierthis year, El Segundo, California-based Space Exploration Technologies (SpaceX)launchedits first privately-developed Falcon1 rocket from a South Pacific atoll which failedjust after liftoff. The firstU.S attempt to orbit a satellite - the Navy's Vanguard TV3 - failed two secondsafter ignition on Dec. 6, 1957. "You can'tget into this business expecting things to be perfect," Larson said. "For someof these launch vehicles and rockets, it's all or nothing." As theSpaceLoft XL crash investigation continues, Larson and other UP Aerospaceofficials plan to attend next week's Wirefly XPrize Cup spaceflight exhibition in Las Cruces, New Mexico, where they willdisplay video of their first flight and discuss their plans for commercial suborbitalspaceflight. "The XPrize Cup is certainly on that cutting edge," Larson said. "I think that's whyit's exciting to everybody. It's not the status quo."